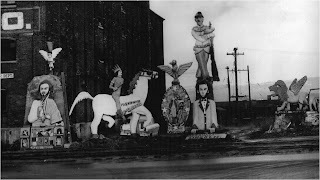 The brightly painted concrete figures must have startled passersby by the way they stood out against the drab industrial landscape. In the 1950s, the upstate New York city of Utica was thriving economically and teeming with immigrants. 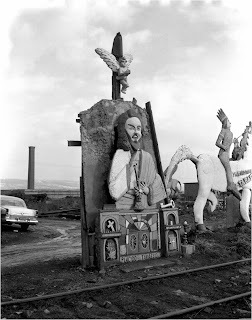 One of them, a retired bricklayer and mason from the Abruzzi region of central Italy created this improbable sculpture park sometime before his death in 1958. Not a trace of it remains today. Very little is known about the artist. Placido Tobasso was born in Italy in 1904. It is not known when he immigrated to Utica, but he lived on Hubbell Street, two blocks from the factories on Broad Street in the eastern part of the city. Most of Tobasso’s working life was spent laying bricks and cutting stone, until poor health forced him into early retirement. Tobasso’s health did not deter him from realizing what must have been a powerful desire to express himself creatively in the materials he knew best: plaster and brick. 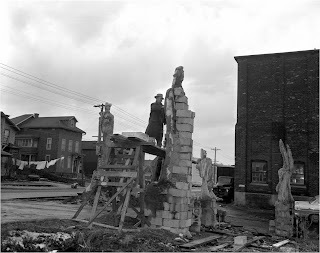 The American Hardwall Plaster Company, located on Broad Street, often gave out broken blocks and torn bags of plaster to worthy people, and Tobasso was among those able to receive building materials for free. 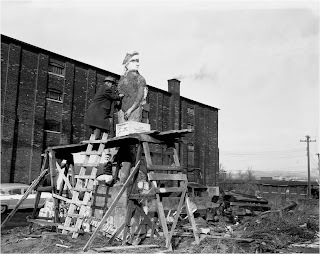 Unlike those who needed and used these materials to build homes and churches, Tobasso used them to create a series of monumental figures on city property for all to see. He chose a vacant lot on Broad Street at the foot of Mohawk Street. 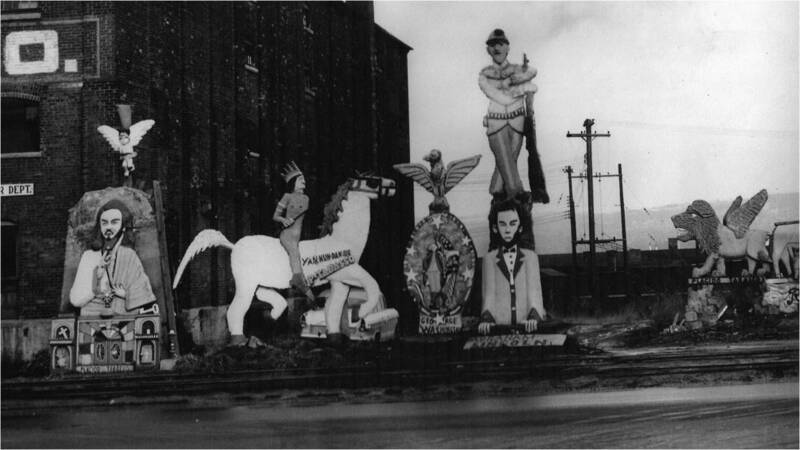 The latter is a major thoroughfare through East Utica, so the sculptures would have been visible for several blocks. 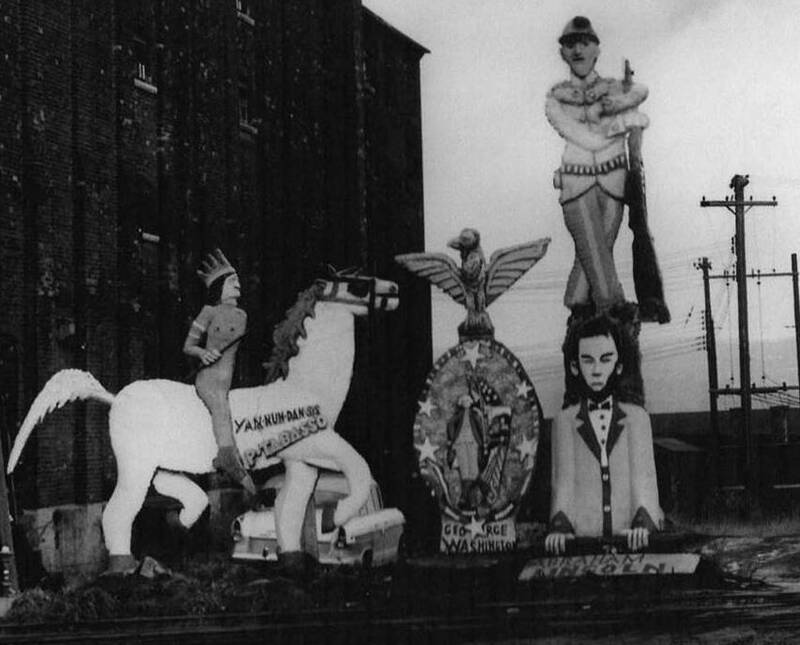 Here Tobasso fashioned large statues of historical figures of his adopted homeland, including the American Indian chief Yahnundasis, George Washington, Abraham Lincoln, and a Civil War soldier. He represented his ancient Roman heritage with a statue of a wolf suckling Romulus and Remus and a figure of a fierce winged lion. Lastly, at one end of the assemblage, Tobasso included a large statue of Christ blessing the immigrant neighborhood he overlooked. It’s a pity that the Utica city officials did not share this view. 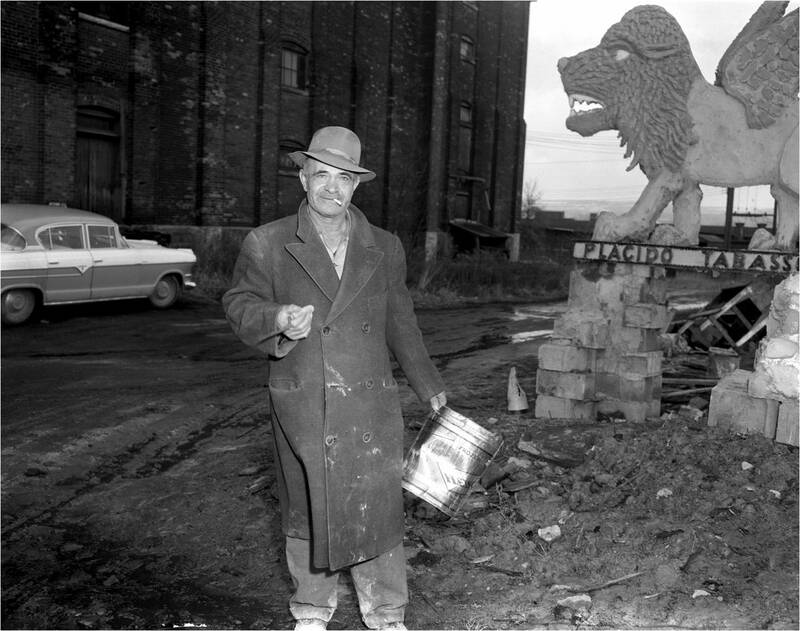 In the 1960s, at the height of the cultural destruction of Urban Renewal, Tobasso’s artwork was destroyed. Fortunately for posterity, these works had been captured (along with pictures of the artist at work) in a series of photographs in the 1950s by the Utica photographer Dante Tranquille. These images speak eloquently of Tabasso’s passionate and public realization of a personal devotion. Nestled among the massive and impersonal industrial complexes, Tobasso’s sculpture park stood for years as an improbable – and all-too-fragile – affirmation of the humanity that toiled within. Gabriel's is a wonderful folk environment that I was not aware of. Many thanks for bringing it to my attention, Laura! Paul, Thanks so much for this! I love how he signed his name to each piece, created along side the tracks (like Rodia), and worked in the very Italian style of the façade (think giglio towers). We can now add Tobasso to the list of Italian-American creators of vernacular art environments: Sabato “Sam” Rodia’s Watts Towers, Emanuel Damonte’s Hubcap Ranch, John Giudici’s Capidro, Romano Gabriel’s Wooden Garden, and Baldassare Forestiere’s Underground Gardens in California, John Greco’s Holyland USA and Salvatore Verdirome’s Sanctuary of Love in Connecticut, Angelo Nardone’s Villa Capri in New Jersey, and Silvio Barile’s Italian-American Museum in Michigan. Thanks, Joe! I just wish there was some semblance of the environment surviving. There are still people around who remember Tobasso, but these are the only photos I have ever found. It's nice to see him recognized as an Italian-American folk artist. Nice to hear from you, Bob! I saw your painting reproduced somewhere, maybe the Observer Dispatch when Gene Nassar published a short editorial on Tobasso. 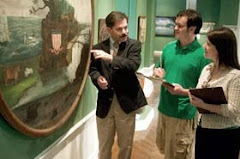 If there is any way to locate pieces of Tobasso's work in and around East Utica, I would love to see it and document it. Let me know. What a terrible loss. Utica is struggling. Think about the tourist attraction potential of that environment today. As a kid I lived in Utica for a year and then just outside for a longer period. It's sad that a city that needs so much did not appreciate what it had. You are so right, Kevin. They let go of so much of their heritage, like so many cities that continue to struggle today. Thanks for your comment. Paul, Placido was my great grandmother's brother. My mom called him Uncle Palach. When Mr. Tranquille's photos became available on ebay, a few years ago, i bought a few of the the photos too. email me if you would like to talk.